For the second time since 1996 an Ocala neighborhood located at the intersection of Southeast 17th Street and 25th Avenue, has fallen victim to a sinkhole. 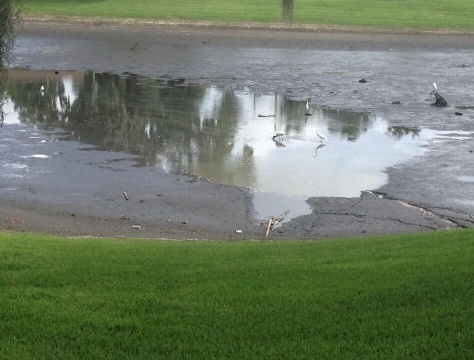 Wes Harren, the property manager of Woodland Village said that on Tuesday afternoon something appeared wrong with the lake located in the community. “I just watched it going down and down,” he said. Harren closed the pool and clubhouse which is closest to the sinkhole for the residents safety. Ocala engineers, area contractors, and the city’s public works department were called out to help. By Tuesday night the lake was completely drained. It once took up five acres of the property and measured eight feet deep in some spots. All that was left was mud and fish flopping about for the birds to feast on. Woodland Village contains patio homes, condominiums, townhomes and estate homes, with a total of about 700 residents living in them. Residents are concerned that there may be an underlying problem that has yet to be detected. Woodland Village has had this lake since 1984, the time in which the development was established.